Holography is a method of producing a three-dimensional (3-D) image of an object. (The three dimensions are height, width, and depth.) The image it brings to life is referred to as a hologram, from the Greek word meaning "whole picture." Unlike a two-dimensional picture, a hologram allows a person to look "around" and "behind" its subject. The hologram is actually a recording of the difference between two beams of coherent light. Light is composed of waves that are all the same length and that travel in all directions. Coherent light is in phase, meaning its waves are vibrating and traveling together in the same direction. To create a hologram, a laser beam (coherent light) is split in two: one beam that stays undisturbed, called the reference beam, strikes a photographic plate. The second beam, called the object beam, strikes the subject and then bounces onto the plate. The subject's interfering with the second beam causes the two beams to become out of phase. This difference—called phase interference—is what is recorded on the photographic plate. When a hologram is later illuminated with coherent light of the same frequency that created it, a three-dimensional image of the subject appears. to take an electron "picture" of an object. However, this process required a coherent light source—something that did not exist at the time. It wasn't until the early 1960s, when the first working laser was produced, that 3-D images could be created. For developing the basic principles of holography, Gabor was awarded the Nobel Prize in 1971. One of the most visible applications of holography is in the field of advertising. Holograms can be found on the covers of magazines, books, and music recordings. In the 1970s, automakers would often use cylindrical holograms to show a new car model. A prospective car buyer could walk around the tube and view the vehicle from all angles, though the cylinder was actually empty. The medical field was also quick to find a use for holograms. A holographic picture could be taken for research, enabling many doctors to examine a subject in three dimensions. Also, holograms can "jump" mediums, that is, a hologram made using X rays can be viewed later in white light with increased magnification and depth. Holography has also been instrumental in the development of acoustical (sound) imaging and is often used in place of X-ray spectroscopy, especially during pregnancies. A critical application of holography is in computer data storage. Magnetic disks, the most common storage device for home and small-frame computers, is two dimensional, so its storage capacity is limited. Because of its three-dimensional nature, a hologram can store much more information. Optical memories store large amounts of binary data (with series of zeroes and ones representing bits of information) on groupings of small holograms. When viewed by the computer using coherent light, these groupings reveal a 3-D image full of information. Credit companies now use holographic images on their credit cards. 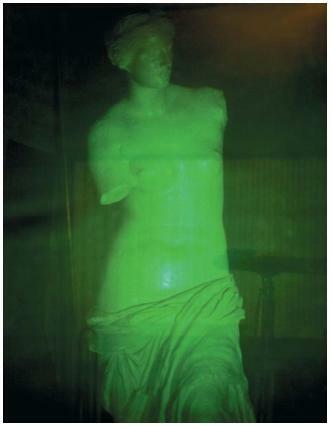 Since holograms are expensive and difficult to produce, the practice discourages counterfeiting.